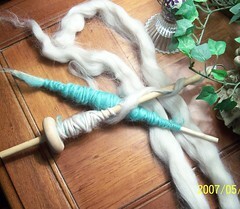 Posted on May 10, 2007	by Linda S.
Last year I found the Joy of Handspinning site. The idea of spinning yarn wi th nothing but a drop spindle intriqued me, so yesterday DH and I spent 20 minutes in the shop and made this… I think that perhaps the whorl is not big enough for the shaft because it does not want to keep spinning. (Here is another video showing how to make a drop spindle from a couple of old CDs)… I must have watched this video about 20 times trying to get things working correctly…grin Anyway, it’s a good thing there are pics online of some beginner’s first efforts at spinning or I would give up now … lol However…. This entry was posted in Crafts, Handcraft, Knit, Spinning, Tutorials. Bookmark the permalink. Maybe we can brain storm on it!